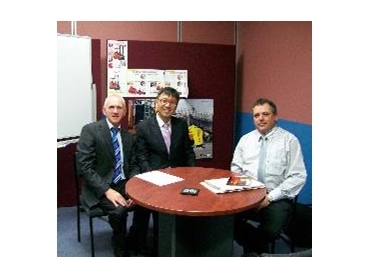 The Hyundai Heavy Industries corporation has reinforced how serious it is in a bid to become a major player in the Australian forklift market with the visit this week to Australia of Mr Vincent Ahn, its Deputy General Manager- Overseas Sales/Construction Equipment. Primary reason for his visit was to take an overview of infrastructure put in place for by its exclusive agent in Australia, Flexilift Australia. Impressed by what he has seen so far in this domestic set up, Mr Ahn said he was very confident that Flexilift will achieve its target of setting up and managing a national distributor network throughout all regions of Australia. He echoed that Hyundai head office in Seoul will provide all necessary support to maximise this aim for complete coverage. Meeting with Flexilift Managing Director Mr Stephen Ritchie, Co-Director Ms Jenny Ritchie and the company’s National Business Development Manager, Mr John Fisher, the four were able to refine marketing strategies, sales forecasts, proposed distributor structures and forklift promotional ideas to build and sustain the Hyundai presence in the Australian market. Also on the agenda was discussion on Flexilift’s high level of service quality and the excellent potential for value adding to forklift markets. According to Mr Fisher, Mr Ahn was very impressed how Flexilift - in a very short space of time - has been able to achieve so many targets and already brought on distributors in Queensland, the ACT and Victoria under a very strict criteria demanded by the umbrella network. "The fact that we have such a high-ranking figure from one of the world's most prosperous industrial companies is a reflection of the hard work we have put into this venture in the last two months," said Mr Fisher. "With Australia's relatively small population across a vast geographical spread, our market could easily be perceived by Hyundai as potentially less profitable than say North America, Europe or Asia. "But Mr Ahn left the country completely confident that our set up is perfect to nationally grow Hyundai as the ideal top-level technology that falls into the upper medium price bracket. "There has been a value-for-money price void for a long time in the Australian forklift industry and while other brands have been forced to cut costs and reduced representation levels across all states and territories, we are gearing up to go the opposite way. "Complete backing from head office of this global corporation proves that our marketing strategy has been right on the mark and we are now fully mobilised to give all industries of Australia exceptionally good value the money in their forklift needs." Beyond the call of professional duty, Mr Ahn was highly impressed by the cultural and culinary levels of the Docklands area in Melbourne. And, this visit was the first time Mr Ahn left a country with a personally autographed novel when John Fisher handed him a signed copy of his first published children's book, ‘Admiral Pip’s Hope’, for his twin four year old daughters.